Duration & Scope: 6-week group design project for the class DES INV 181: Reimagining Mobility taught by Purin Phanichphant; worked together with Yoyo Ko and Andrew Briggs. How might we use autonomous vehicles to do things beyond moving people? We started defining the scope of our project by doing a mind-mapping activity. 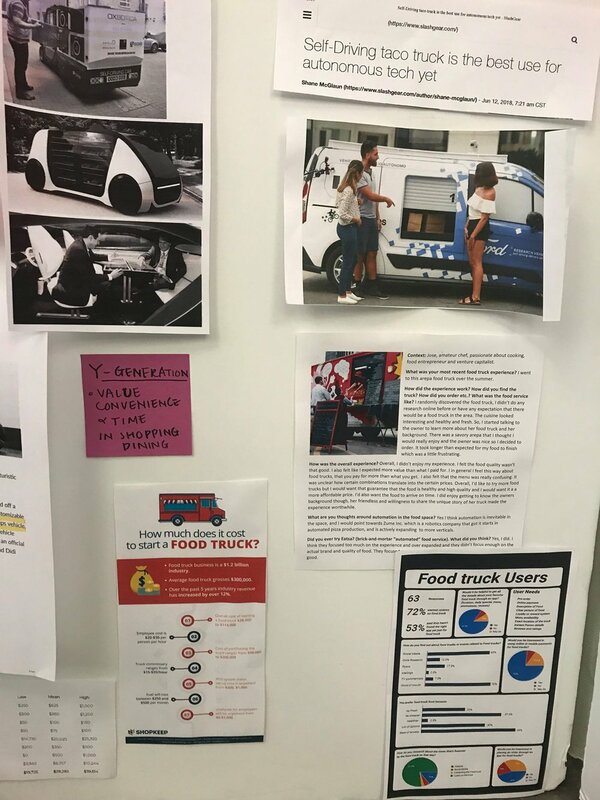 After brainstorming for areas and potential functions related to the future of autonomous vehicles, we decided to narrow down to the transportation of food, including the supply chain, the service sector, and the food delivery process. After defining the general scope, we conducted interviews with students, barista, and amateur chef to investigate their respective painpoints and potential opportunity spaces. In the meantime, we dived into secondary research about existing products to learn about the current landscape and gain some inspirations. We wrapped up the first round of research by creating a research board with post-its, pictures, and articles that we found inspirational for the next steps. As we conducted and compiled our research findings, we came to discover an opportunity space that all three of us found interest in, which was the transportation of healthy food, such as salad, which is made up of relatively fresh ingredients. To better understand the problem space and identify user needs, we decided to take a closer look at both the supply and end user sides of the salad transportation and consumption experience. how might we use autonomous vehicles to increase access to healthy food options such as salad? With this statement in mind, I created a survey that asked about college students’ daily food decisions. We collected 46 responses in total and identified the major barriers between students and healthy eating, which was lack of affordability and access. In addition, we were also able to identify 2 major user groups. One group values convenience and low price, whereas the other group values the dining experience and social interaction that takes place within the process. In addition to understanding the end consumers’ needs, we also did some research on the supply chain of salad ingredients. We took lettuce as a typical example and did a more in-depth analysis of painpoints at the system level. 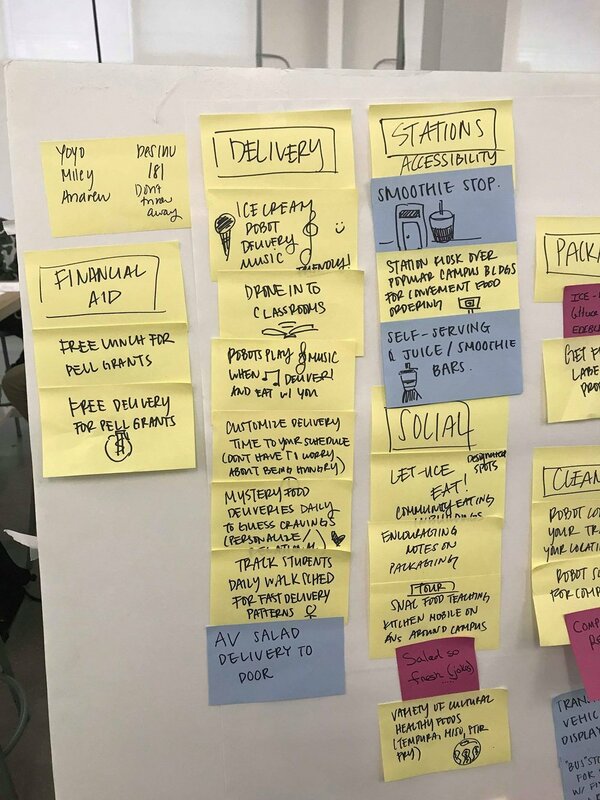 After identifying the need for accessible and affordable healthy food, we started ideating for ways to introduce the use of autonomous vehicles. Instead of brainstorming for individual product concepts, we aimed to come up with the magical “wow moments” that could be incorporated into the process. The team voted out the top three ideas to expand on and each of us made a one-page to elaborate on the concept. The idea that we decided to proceed with was the salad truck idea that I focused on. As previously mentioned, from our research, we identified two user groups in terms of dining preferences. We initially wanted to accommodate the needs of both groups by including a seating area in the truck and a fast ordering process for those who need grab-and-go. However, our idea pivoted after we conducted an expert interview with Greg Becker, the founder of Bbox. Bbox is an automated cafe located on Berkeley campus that makes and serves coffee and pastry using robots. Greg mentioned that there are tradeoffs between users who value convenience verses fine dining experience. The use of automation would enable saving of two large costs, which are rent and labor cost, but it will not be an option to replace brick and mortar accounts. After considering the findings from our research earlier and the insights from the conversation with Greg, we decided to pivot our idea towards the needs of users who value fast and convenient dining experience. How might we be able to design, serve, deliver students on campus cheap, fresh salads conveniently with automation? We also make the ordering and pickup process fast and easy for our end users. With the introduction of autonomous vehicles, our vision for Freshest would expand beyond a certain opening time and eventually be able to operate 24/7 and potentially provide special night-time delivery services with a parent-child system that dispatches smaller bots to deliver our Freshest salads. Freshest can also be expanded outside of campus — work district, parks in the city, music festivals… With the advantage of mobility, it is possible to plant our Freshest trucks anywhere. We can also go beyond salads and expand our menu — it could be smoothies, acai bowls, sandwiches… with our vertical integration that guarantees the freshness of ingredients, the future of Freshest could also unleash the possibility of more food choices.